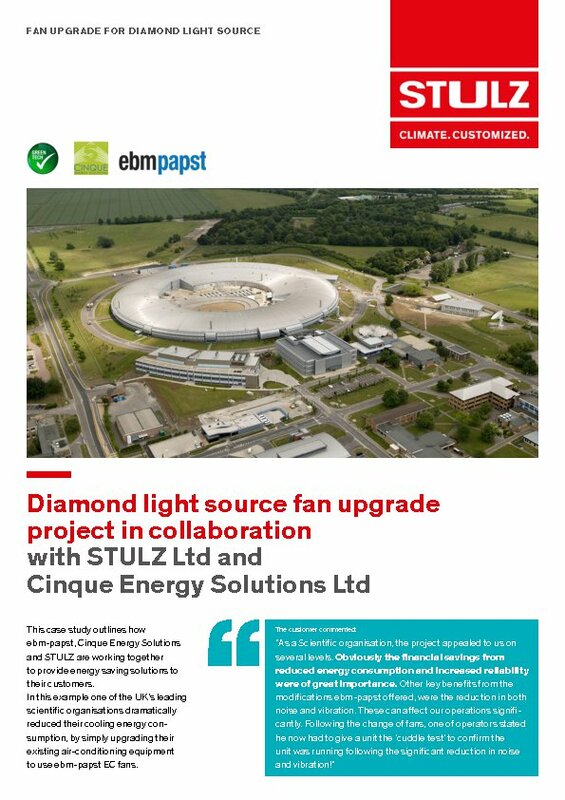 This case study outlines how ebm-papst, Cinque Energy Solutions and STULZ are working together to provide energy saving solutions to their customers. In this example one of the UK's leading scientific organisations dramatically reduced their cooling energy consumption, by simply upgrading their existing air-conditioning equipment to use ebm-papst EC fans. The inception of the project was mid 2012 when STULZ requested us to carry out a site survey for upgrading some of their computer room air conditioners. Normally this type of unit is used for Data Centre cooling but in this case the equipment was being used to cool electronic equipment rooms around the perimeter of the Diamond Light Source synchrotron in Didcot. Phase 1 of the project was to upgrade 29 x CCD900CW STULZ downflow CRAC units from their traditional AC forward curved centrifugal blowers to EC backward curved impellers. The initial site survey was carried out to ascertain what the current solution delivered in terms of power draw and performance. Suitability for upgrade also had to be considered. The blowers would be replaced by EC backward curved impellers but due to the limitiation of the scoop which feeds the air into the room, the EC solution had to be mounted within the CRAC unit enclosure rather than below. The proposed solution was to use the latest RadiCal 560 mm impeller from ebm-papst which offers excellent energy efficiency. The fans would be mounted into bespoke metalwork frames to angle the airflow to assist with the air delivery into the room. The metalwork and assembly are all carried out at ebm-papst UK Ltd where we have a dedicated production area capable of offering custom solutions. An initial survey was carried out and the results presented to STULZ and the end client, with a view to carry out a single unit trial to prove the concept. In January 2013, the trial installation of one unit was carried out by Cinque Energy Solutions. The aim of the trial was to confirm the bespoke design and prove the potential energy saving and benefits to the customer. Initial results showed a 43% improvement in kVA compared with the original AC fans. For the trial the unit was not physically modified, which allowed the potential to revert back to the original set up if desired. It was agreed that for the complete upgrade that the floor of the CRAC unit would be opened up further to allow the new fans a less restrictive system resistance to increase efficiency further. The trial unit was set up to match the previous airflow but due to the simplicity of the control of EC fans, a simple manual 0-10v controller was fitted to the CRAC unit to allow each unit to be tuned to the room requirements. Over the course of a few months the maintenance team was able to adjust the fan speed to optimise the solution even further. The upgrade of the 29 units was scheduled to be completed during a 'shutdown period' in August 2013. The complete upgrade had to be finished within a 2 week window so 2 teams from Cinque Energy Solutions were deployed to work on units simultaneously. All 54 fans were delivered to site and positioned near the units to cut down on delays during the conversion. After the complete installation, the original unit which had previously been measured for the trial, was remeasured following the floor pan being opened up to the designed requirements. This in addition to the fine tuning of the fan performance gave the following improved results. The improvement in kW's even with the skew of improvement in power factor (0.6 to 0.9) also gave an improved result compared to initial estimations. The successful completion of phase 1 of the EC upgrade has led to a 55 % energy saving from the original AC fans, bringing a £ 36k energy saving per annum as well as significantly reducing noise and vibration from the units being transmitted into other parts of the building. Phase 2 of the project, to convert the remaining STULZ cooling units is scheduled for upgrade at the next shutdown period. "As a Scientific organisation, the project appealed to us on several levels. Obviously the financial savings from reduced energy consumption and increased reliability were of great importance. Other key benefits from the modifications ebm-papst offered, were the reduction in both noise and vibration. These can affect our operations significantly. Following the change of fans, one of operators stated he now had to give a unit the 'cuddle test' to confirm the unit was running following the significant reduction in noise and vibration!"